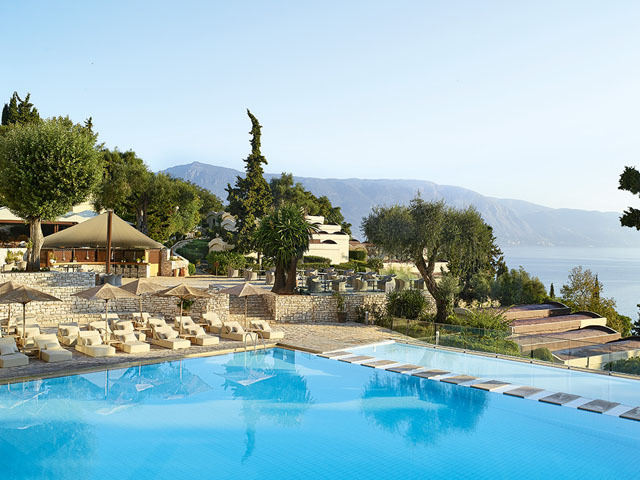 Grecotel Hotels & Resorts is excited to invite you to a refreshing and ultimate holiday concept which combines spectacular beachfront location with great design, personalized modern services, outstanding food and beverage selection, multiple activities and entertainment. 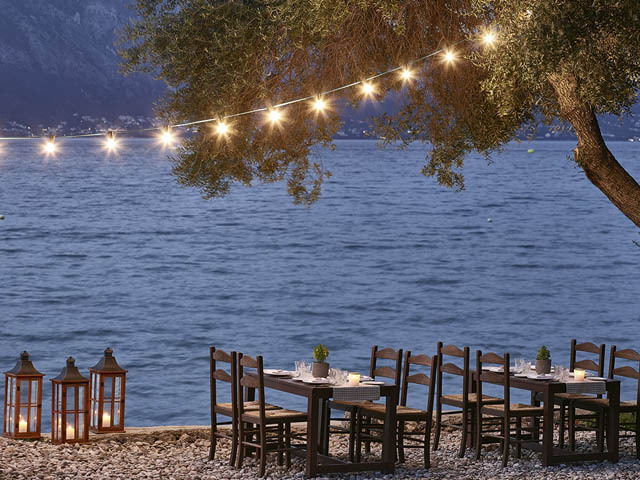 Once a favoured retreat with golden-era jetsetters and royalty, the magical island of Corfu is a natural beauty covered in velvet green cypress trees and silver olive groves, with mountainous skylines that plunge into the bluest of waters. An island hideaway ready to host the most fairytale of holidays, its Italianate architecture, golden beaches, enchanting nightlife and fine cuisine, still attract visitors from all over the world, making them feel right at home with a welcome as warm as its sun! There is no other place on earth that would be so full of beauty and its variations. Yes they come here for the beauty of the sea, the sky, the earth. 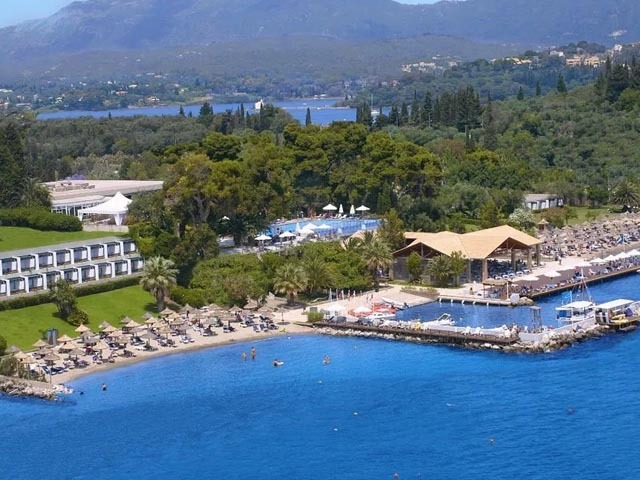 Corfu island where Grecotel occupies the most gorgeous Kommeno peninsula with 3 amazing resorts. Peninsula’s gorgeous natural setting with an unsurpassed collection of exclusive accommodation among luxuriant, splendid gardens along the shore’s edge. 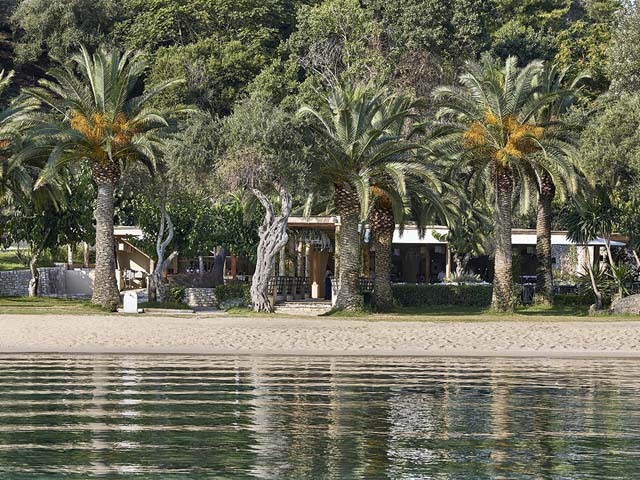 Bungalows snugly embraced by pine groves over the Ionian Sea. Stylish, intimate guestrooms in the main building with open plan configuration and Ionian-style decor for a sense of space and grandeur. They look out onto a fully furnished balcony with beautiful views to the lush landscape. Superior Rooms feature twin or king-size bed, one sofa-bed ideal for a child and en suite private bathroom. Large glass windows offer seamless transitions between indoors and outdoors. Delightful touches like roomy armchairs, wrought-iron standing lamps with diffuser shades and cool wood-effect floors add to holiday comfort. 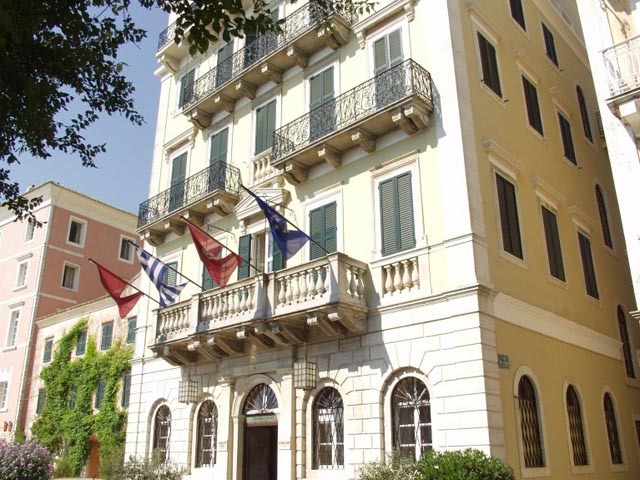 Well-appointed main building accommodation with open plan configuration and Ionian-style decor for a sense of space and grandeur. 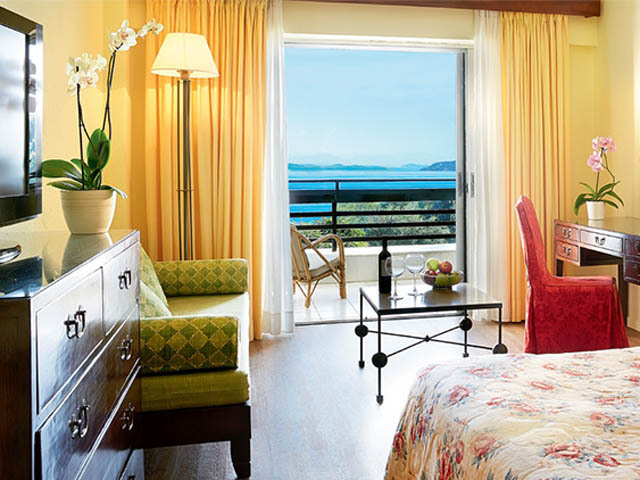 Superior Rooms look out onto a fully furnished balcony with amazing views over the lush gardens cascading to the sea. They feature twin or king-size bed, one sofa-bed ideal for a child and en suite private bathroom. Large glass windows and open plan design give a unique feel of expansiveness and offer seamless transitions between indoors and outdoors laid back Greek summer living. Delightful touches like roomy armchairs, wrought-iron standard lamps with diffuser shades and cool wood-effect floors add to holiday comfort. Brand new spacious comfortably appointed airy garden rooms with views of the surrounding lush vegetation and mature Mediterranean gardens. The open plan design and exclusive furnishings of these guestrooms offer the unique feeling of luxury and comfort. The sleeping area features a romantic king size bed draped in filmy voile or twin beds, while the lounge with a sofa bed can accommodate one child. 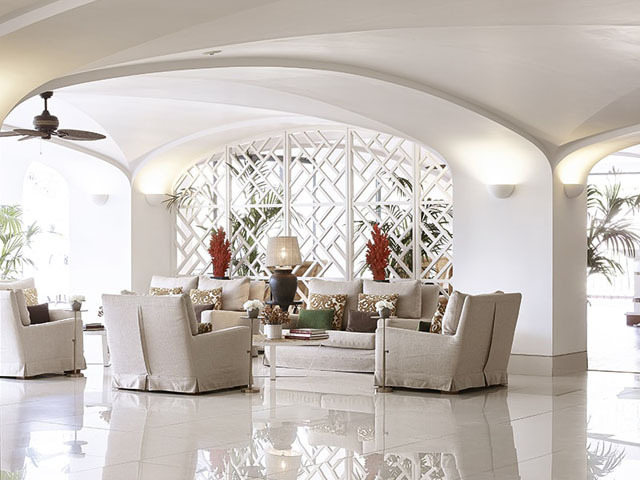 The stylish decoration with Corfiot Tufo colour, local stone floors and fabrics in varying shades of ivory, cream and sand provide an ideal Mediterranean holiday retreat. En-suite private spa-inspired marble bathroom and floor-to-ceiling large glass panels for seamless indoor-outdoor transitions. 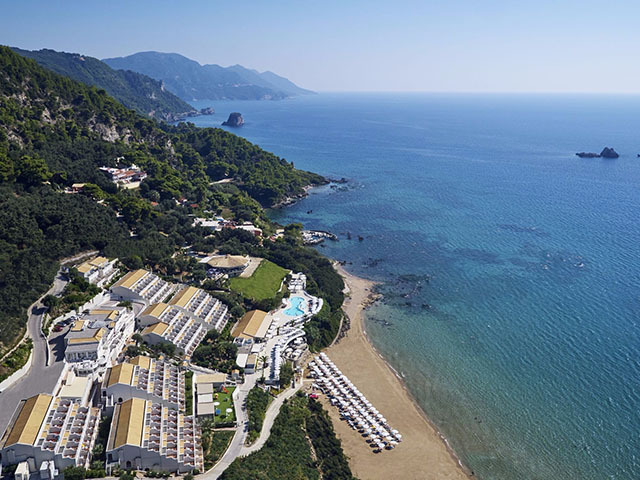 Ideally located on the top floor of the resort LUX.ME Sky Rooms provide a dazzling view of the lush Corfu landscape and the eternal Ionian Sea. The guestrooms’ décor matches this panorama and with opulent furnishings. They feature Ionian style decoration with twin or king-size bed, comfortable seating with one sofa-bed that can accommodate one child and en suite private bathroom. Comfortable and gracious setting with roomy armchairs, wrought-iron lamps with diffuser shades and cool wood-effect floors create an atmosphere of simple luxury. Large glass windows give a unique feel of expansiveness and offer seamless transitions between indoors and outdoors laid back Greek summer living. The brand new Daphnila Bungalows with limited sea views are spacious comfortably appointed airy garden rooms that look out onto the surrounding lush vegetation and mature Mediterranean gardens. The open plan design and exclusive furnishings of these guestrooms offer the unique feeling of luxury and comfort. The sleeping area features a romantic king size bed draped in filmy voile or twin beds, while the lounge with a sofa bed can accommodate one child. Mediterranean setting with rustic details like Corfiot Tufo and local stone floors, while fabrics in varying shades of ivory, cream and sand provide an ideal holiday retreat. En-suite private spa-inspired marble bathroom and floor-to-ceiling large glass panels for seamless indoor-outdoor transitions. Experience Hideaway Daphnila Bungalow, a unique oasis for couples or young families, designed with life’s luxuries and the flair of al fresco living. It features everything necessary to create a private moment to enjoy the comfort of a care-free haven within the picture perfect, pine-covered hillsides of Daphnila Bay. This hideaway option is every nature lover’s dream, while its privileged setting provides ultimate freedom with all the resort’s services in hand. 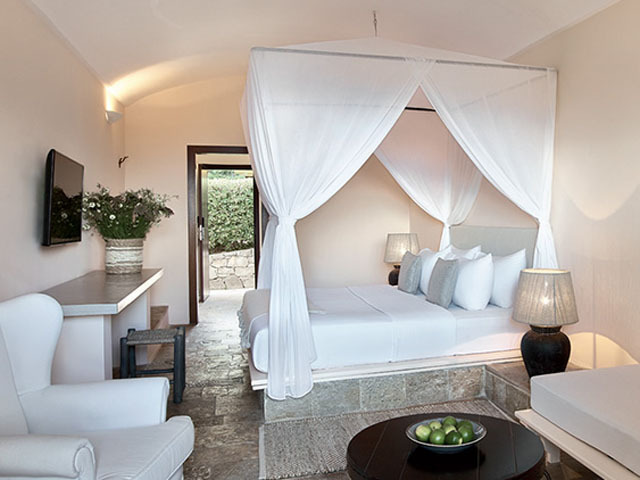 Newly renovated garden rooms, where sand overtones, neutral colored furnishings, local stone floors and hand-woven fabric details create a romantic atmosphere. Open plan master bedroom with comfortable bed draped in filmy voile and lounge area accommodating a child. En-suite private spa-inspired marble bathroom .The glass floor-to-ceiling panels are offering the desired indoors/outdoors experience with lavish panoramic green and blue views. Your fully furnished balcony or terrace is the perfect place to unwind, relax and connect with earth’s beauties. Spacious family accommodation designed with ample living and sleeping areas. Refreshed Daphnila Family Bungalows feature an entrance lounge that can serve as second bedroom ideal to accommodate two children. Master bedroom with four poster king size bed, while cool tiled floors, natural fibres, chestnut wood, rattan and iron invigorate bungalows with warmth and style. These comfortable garden rooms are ideal for families of 5 and offer beautiful views to the lush gardens and everlasting Corfiot landscape with floor-to-ceiling glass doors. En suite marble bathroom and separate WC with individual access from both bedrooms. Fully furnished balcony or terrace for endless relaxation. These large updated guestrooms in a beautiful family friendly setting are the epitome of gracious bungalow comfort. The main bedroom comes with an oversized bed (2.00mX2.50m) for unique laid-back comfort. Adjoining lounge area with two sofa beds, ideal for children, opens onto a fully furnished balcony overlooking the lavish landscape. The sleeping areas are divided with a sliding door (Japanese screen style). Paradiso Family Bungalows feature Mediterranean style decoration complemented by local stone floors, wrought iron details and stylish yet functional furnishings. En suite marble bathroom and separate WC. Newly updated spacious bungalows live up to their name of being a true heaven for families. Ideally located in a beautiful kid’s friendly setting Paradiso Family Bungalows overlook the lavish landscape. The main bedroom comes with an oversized bed (2.00mX2.50m) for unique laid-back comfort. Adjoining lounge area with two sofa beds, ideal for children, opens onto a fully furnished balcony offering turquoise sea view through clearings in the vibrant foliage. The sleeping areas are divided with a sliding door (Japanese screen style). These magnificent garden rooms feature Mediterranean style decoration complemented by local stone floors, wrought iron details and stylish yet functional furnishings. En suite marble bathroom and separate WC. Loose-weave fabrics, earthy tones and natural, local stone floors are some of the features this secluded bungalow offers to an adventurous family. The paths between the dense flora lead to an extraordinary experience for you and your loved ones. The combination of nature and luxury create the ideal Mediterranean-styled, castaway scenery for the chosen who seek vacation born out of a fairytale. The main bedroom comes with your ticket to daily escapes, an oversized bed (2.00mX2.50m), where you don’t just rest, you revel in the day’s moments. Adjoining lounge area with two sofa beds ideal for children opens onto a fully furnished balcony overlooking the lavish landscape. Large glass panels offer seamless transitions between indoors and outdoors space. The sleeping areas are divided with a sliding door (Japanese screen style). Paradiso Family Bungalows feature stylish decoration complemented by local stone floors, wrought iron details and stylish yet functional furnishings. En suite marble bathroom and separate WC. 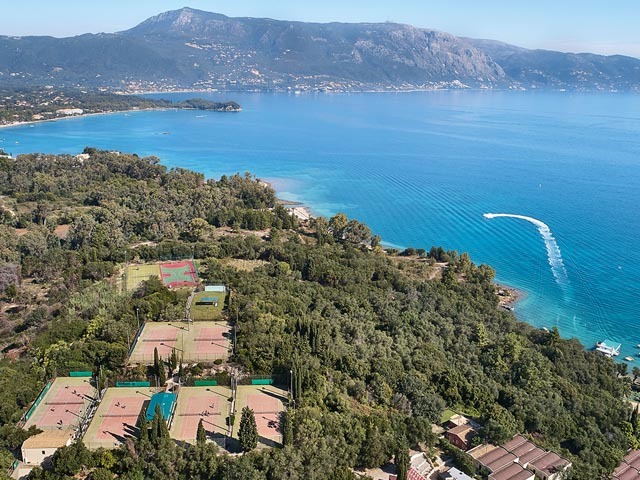 Just steps from the crystal clear waters of the Ionian Sea newly updated Mediterranean styled bungalows in a beautiful family friendly setting providing ultimate freedom with all the resort’s services in hand. 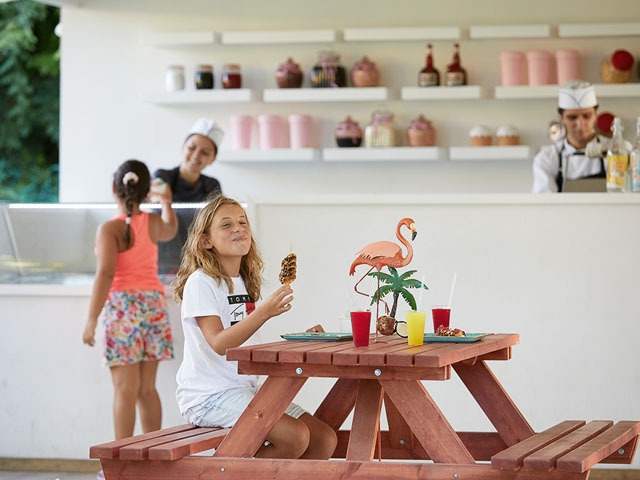 A heaven of calm ideal for younger guests and their parents, LUX.ME Sea Side Family Bungalows open onto a fully furnished terrace for seamless indoor-outdoor Greek summer living. To us, luxury means laid-back comfort and inspiration, so this certainly applies to the master bedroom with an imposing oversized bed (2.00mX2.50m). Adjoining lounge area with two sofa beds, ideal for children. Stylishly decorated in loose-weave fabrics, muted earth tones, wrought iron details and natural local stone floors, guestrooms exude the sophistication of a care-free waterfront lifestyle. 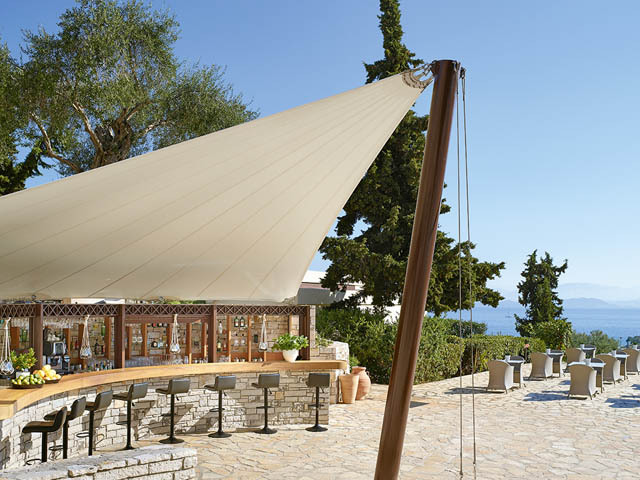 Large glass panels enable superb views to the wrap around lush foliage with the Ionian Sea at the back ground. Robinson Crusoe Family Bungalows with Limited Sea View come with a master bedroom featuring a centerpiece of comfort, an oversized bed (2.00mX2.50m). Adjoining lounge area with two sofa beds ideal for children opens onto a fully furnished balcony overlooking the lavish landscape with turquoise sea view through clearings in the vibrant foliage. The sleeping areas are divided with a sliding door (Japanese screen style). En suite marble bathroom and separate WC. Large glass panels offer seamless transitions between indoors and outdoors space. The panoramic view lays at your feet and enhances this special summer accommodation. Set on the first row among seafront mature gardens and lush vegetation Paradiso Family Bungalow is a dream summer house for all. Just moments away from the Ionian and the waterfront restaurants and bars these spacious updated guestrooms boast a privileged setting providing ultimate freedom with all the resort’s services in hand. Connect with nature, connect with yourself and cherish private moments with the ones you love in these magnificent bungalows ideal for families of five. They comprise of a main bedroom that comes with an oversized bed (2.00mX2.50m) for unique laid-back comfort. Adjoining lounge area with two sofa beds ideal for children. 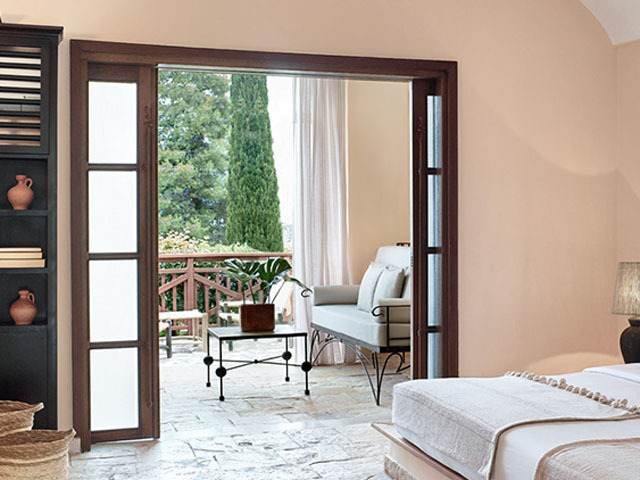 The sleeping areas are divided with a sliding door (Japanese screen style) and feature Mediterranean style decoration complemented by local stone floors, wrought iron details and stylish yet functional furnishings. Through large glass panels lounges open onto a fully furnished balcony overlooking the lavish landscape offering turquoise sea view through clearings in the vibrant foliage. En suite marble bathroom and separate WC. Two Superior Rooms with Garden View and Private Balcony combined through connecting doors form the Grand Family Room (Family Apartment) Garden View accommodating a total of 4 adults + 2 children. Experience LUX.ME Paradiso Bungalow Suite, a unique oasis for couples or young families, designed with life’s luxuries and the flair of al fresco living. It features everything necessary to create a private moment to enjoy the comfort of a care-free haven including a unique location among sea side gardens. 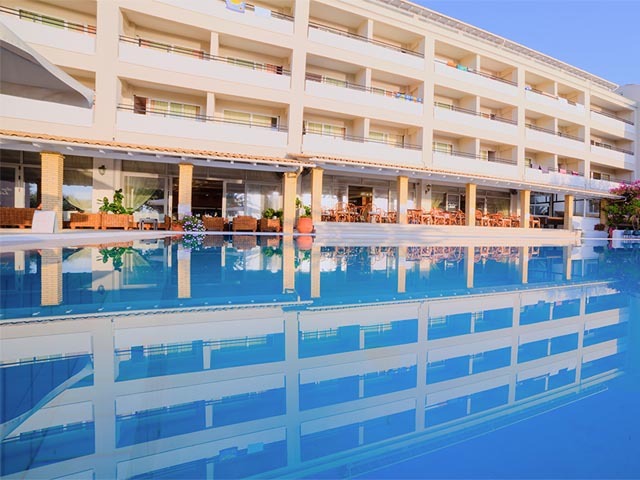 Just moments away from the Ionian crystal clear waters and the waterfront restaurants and bars the suite boasts a privileged setting providing ultimate freedom with all the resort’s services in hand. Master bedroom with king size bed and adjoining living area with comfortable lounges accommodating one child. Corfiot Tufo, local stone and hand-woven fabrics update rustic style to a contemporary level that reflects the suite’s standard comforts and ultra-modern amenities. En suite marble bathroom and separate WC. Guests will discover a unique indulgent feeling while lounging al fresco at the fully furnished balcony overlooking the lush scenery with turquoise views through clearings in the vibrant foliage. The bright new luxurious Villa is a special class of Daphnila accommodation with added comforts for larger parties or families with children including two separate sleeping areas, two private bathrooms, ample grooming area and a fully equipped kitchen. 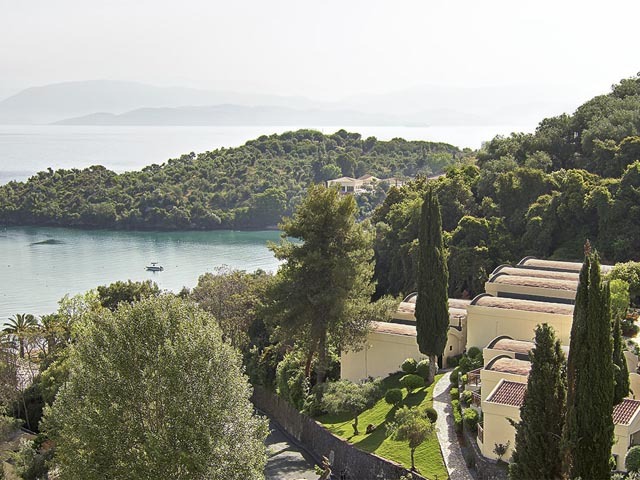 Inspired by the royal aesthetics of Corfu’s Italianate architecture, this elegant Corfiot Villa, high above the sea, is ideally secluded among mature gardens within the resort’s grounds. Occupying an amazing 350sqm location with pine and olive trees the Dream Villa offers unrivalled panoramic sea views. Walking through a private courtyard, guests enter the lavish contemporary interiors. Leading off the entrance lobby there is a light filled sea view living area including a fully equipped kitchen. Comfortable lounges with delicate golden details and natural fabrics in shades of sand, ivory and cream with pearl accents. Large glass panels offer seamless transitions between indoors and outdoors to enhance summer living. Private spa inspired marble bathroom with walk-in shower. The master bedroom suite with parquet floor centres around the romantic white coloured canopy bed. It features generous wardrobes and spa inspired marble private bathroom with walk-in shower and double washbasins. Second bedroom with front sea views features lavish decoration in summer colors. Outdoor living area: oversized elevated terrace with comfortable furniture ideal for dining al fresco. 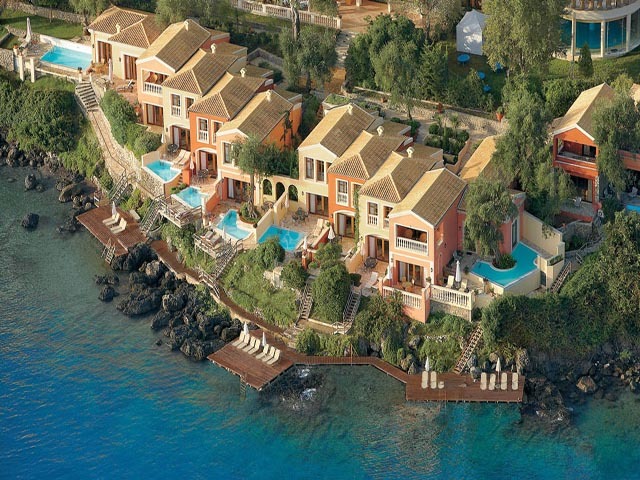 Enjoy amazing views to the lush gardens and the Ionian Sea. 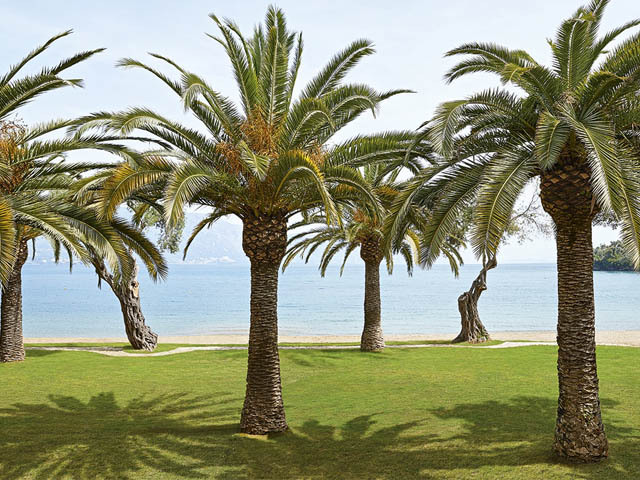 Seize the day with the company of the sun on a glorious Corfu-Summer living scenery. 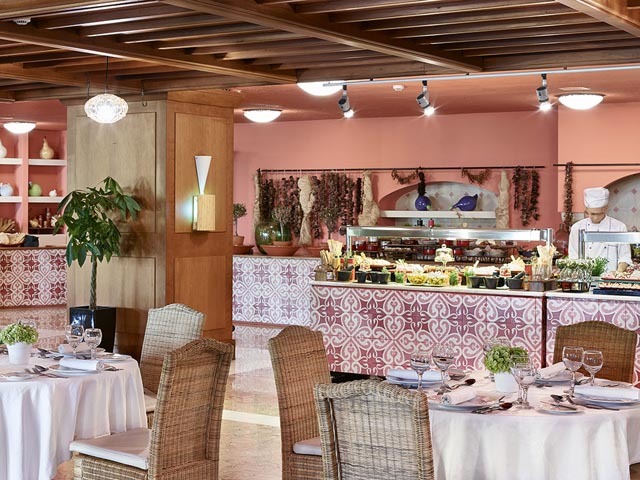 The Mediterranean Cuisine Delicacies Buffet is located in the main building, next to the lobby area level. 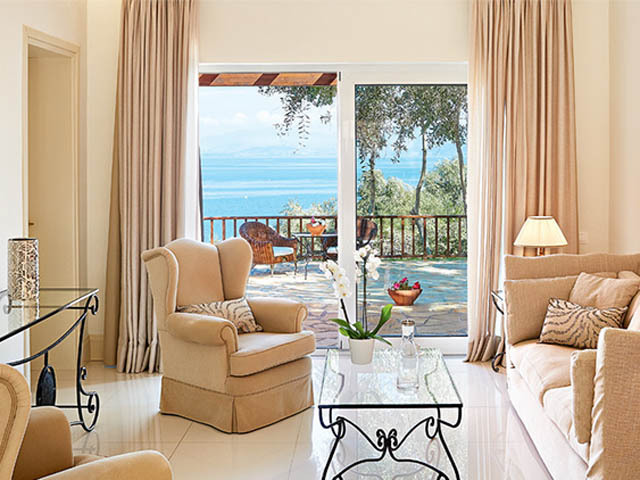 The Stylish décor and the breathtaking views to the Ionian sea are stunning. Gastronomy concepts created around seasonal ingredients and infused with ethnic overtones. 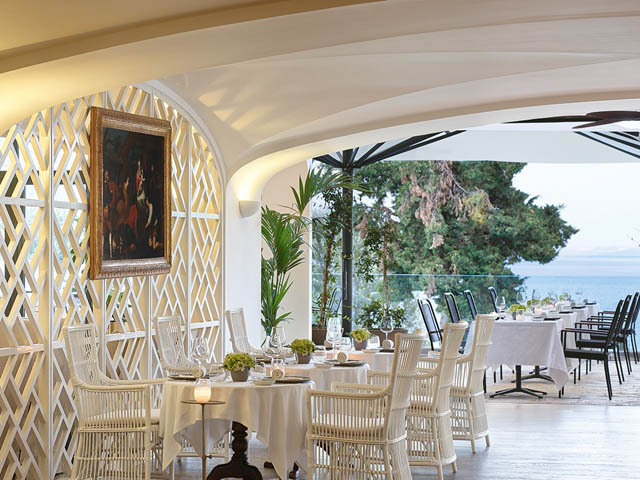 Fine Dining in “Il Gattopardo” is an experience accompanied by exceptional service in outstanding scenery…. Dinner: 19:00-23:00. Selected days & weather permitted. It is all Greek to you, in this contemporary style ”Tavernaki” . It’s meze & Ouzo time with warm bread, olive oil and oregano. 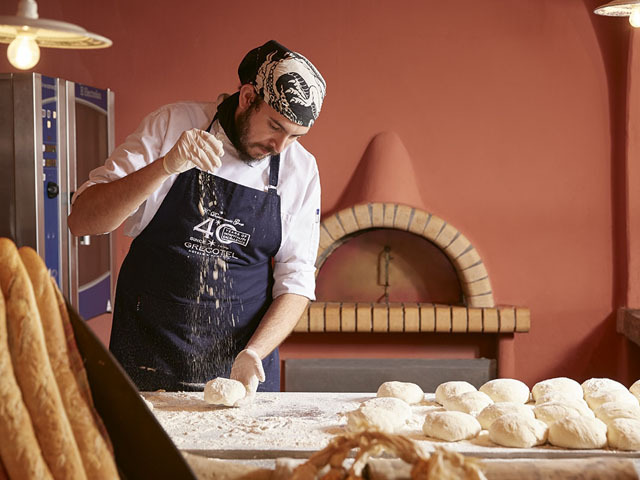 Here, the food is authentic and with delicious unique traditions and exceptional service, just enjoy and relax. Lunch: 12:30-15:30, Dinner: 19:00-22:30. Selected days & weather permitted. Start your day with a tasty breakfast at the beachfront à la carte restaurant consisting of healthy local delicacies and omelette station. Our Chef will be happy to prepare for you fresh eggs of your choice a la minute, whilst enjoying the breathtaking views over the sea. Located at the beach area, with a refined atmosphere exquisite a la carte menu of authentic Italian cuisine. Enjoy the stunning views of the endless blue, while you are having your morning espresso. Allow live Entertainment or relaxing music to soothe your while enjoying delicious Italian flavors. Breakfast: 08:00-10:00 (Buffet), Lunch: 12:30-14:30 (Buffet), Dinner: 19:00-22:00. Selected days & weather permitted. The newest addition to the Eva Palace’s restaurant portfolio is our cool new Steak & Sushi Restaurant offering the very best of what the Ionian Sea and Greek pastures have to offer! Skillfully rolled sushi flavours using the freshest catch of the day pair with the finest steaks that money can buy. Enjoy this zesty fusion of flavours and your favourite cocktail, whilst indulging in the uninterrupted views across the azure horizon and the flickering lights of the coastline. 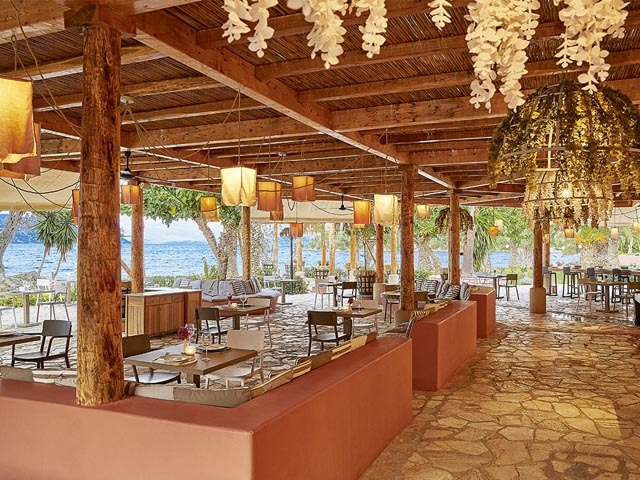 Enjoy the delicious flavors of the Far East in the al fresco dining area with the eye-popping panorama of the Ionian Sea. 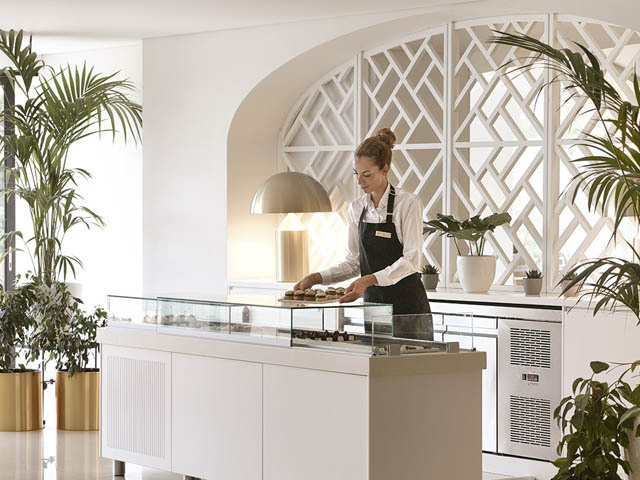 Located in the Resort’s lounges, is the ultimate dreamy pastry shop with a variety of treats: dessert breads, pastries, cakes a candy bar and a selection of low-calorie temptations for guilt-free indulgence. The guest may see and taste the unique masterpieces created by our chefs driven by a passion to create the perfect pastry. Enjoy hearty and simple favorites, like scrumptious sandwiches, salads, baguettes, tempting hamburgers and tortillas and special snacks, all prepared with the freshest ingredients. 24 hours/7 days is a week lounge and dine with coffee, pastries, light bites. 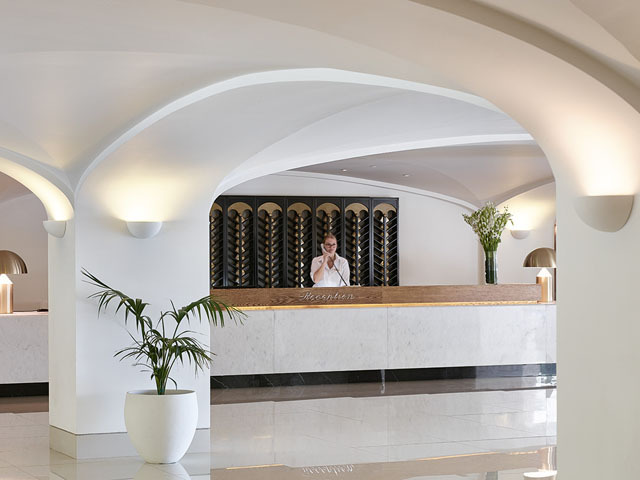 The Wine Tasting Room from which the guests with the consultancy of our sommelier, may taste exceptional wines from a vast variety of etiquettes, will guarantee a memorable experience. “Aristos” a la carte restaurant was named after Greek shipping tycoon Aristotle Onassis whose private island ‘Scorpios’ is nearby. Elegant décor, outstanding service and a brand new carte, one of the most lavish menus in Greece with the signature of our chef all add up to a unique dining experience. 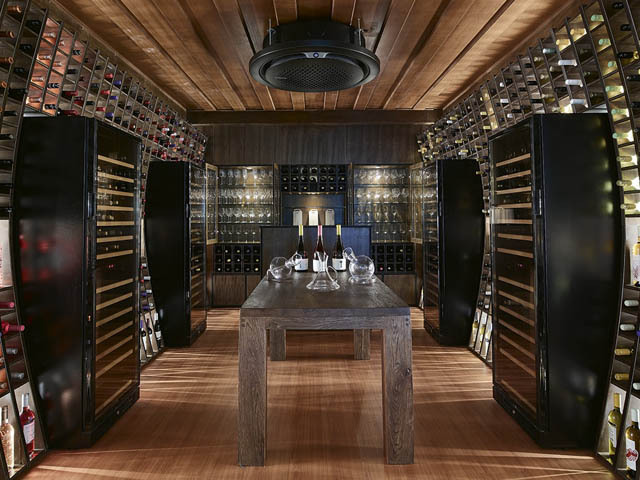 Indulge in the selective wine list. 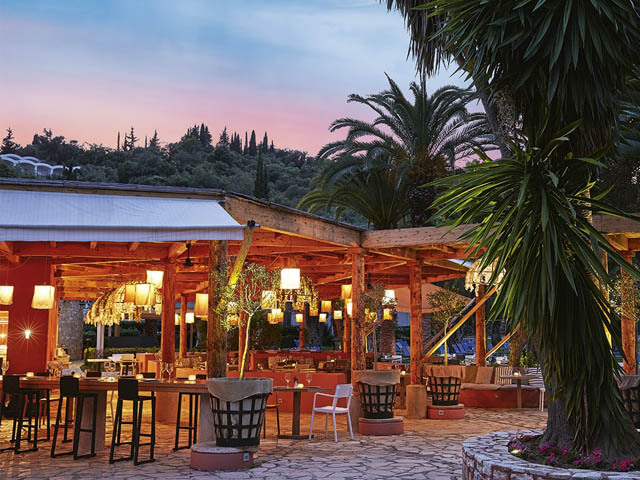 The Yali Seafood Restaurant at the Corfu Imperial is only a deck above the clear azure water. Its vast panoramic views of the island are unique in a restaurant… you can see the glimmering lights of the town in the horizon. Join in on the finest gourmet dining al fresco where you can delight in the fresh catch of the day while snuggling your feet into the refreshing sand. 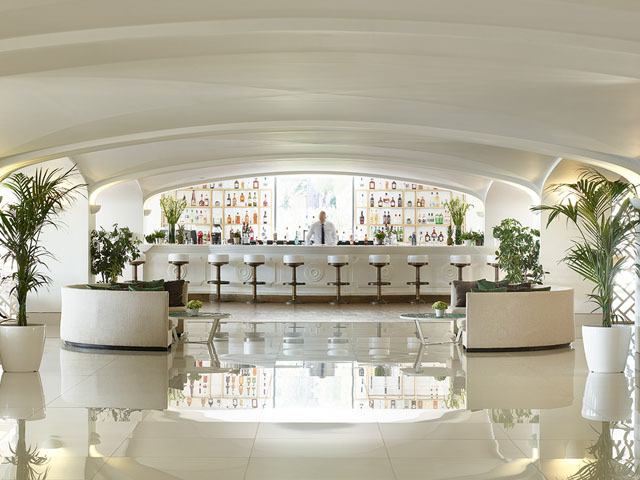 The trattoria elevates casual Italian dining with a mix of rich, warm finishes and a variety of culinary experiences. A mix of rustic and refined, the wine bar invites guests to explore a mix of wine, cheese, charcuterie and more both indoors and out. An elevated, but relaxed tasting experience. 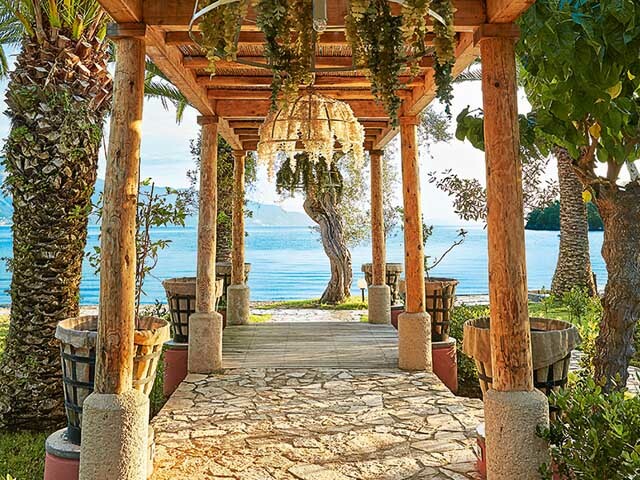 What better place to celebrate special moments at private functions watching the best sunset on Corfu? Daphnila Bay Dassia offers a wide selection of dishes with thoughtfully crafted menus from the hotel’s expert culinary team. We are pleased to offer delicious, healthy dining options and can accommodate any special requests you may have. Please inform us in advance. Restaurants are subject to availability and weather conditions, reservation required except Antica Cucina. Open: April to October ... Grecotel Hotels & Resorts is excited to invite you to a refreshing and ultimate holiday concept which combines spectacular beachfront location with great design, personalized modern services, outstanding food and beverage selection, multiple activities and entertainment.